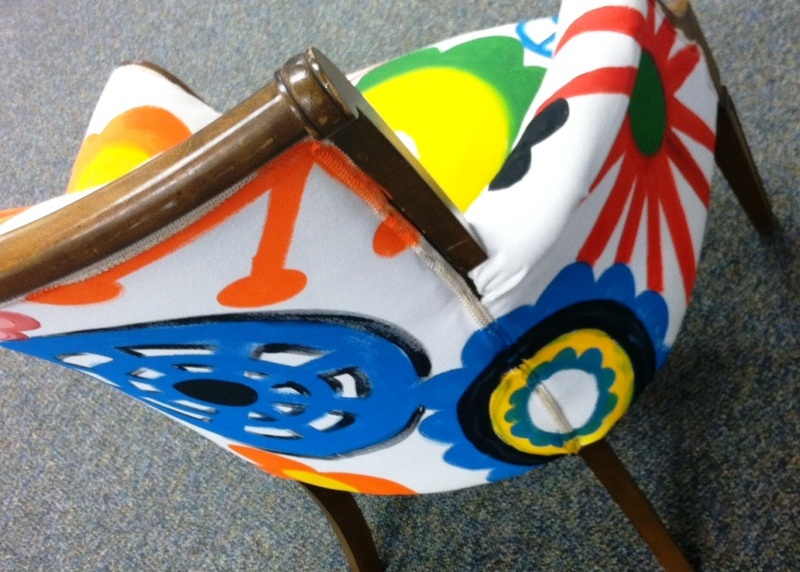 Have you been seeing painted upholstery all over Pinterest and DIY blogs lately? Well, we’ve jumped on the painted-upholstery bandwagon too! And now we have a cool, new storytime chair. We started with a chair that we already had at the library. It was a good size and shape, but after years of use it was looking pretty sad. The fabric was stained and worn completely through on the seat. 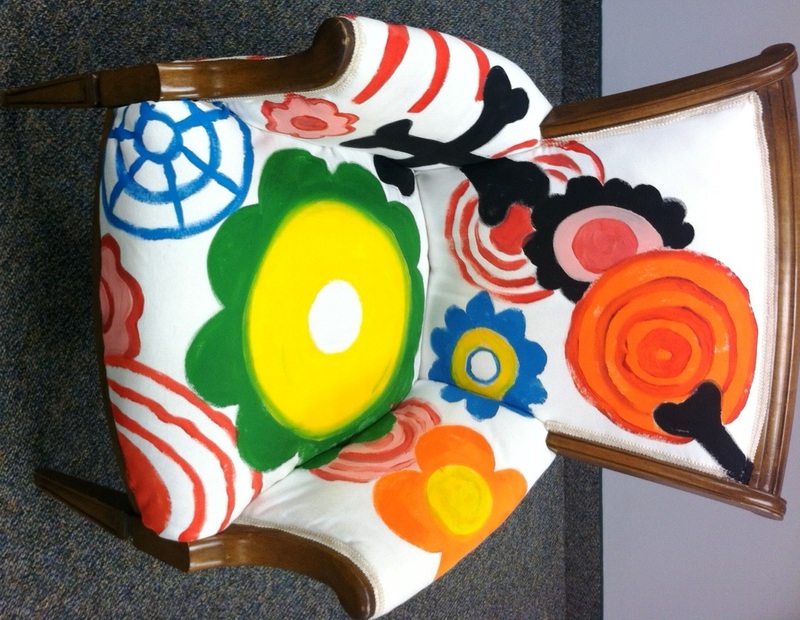 Chris from Kitchen Table Studios, a local artist and library patron, offered to remake this chair for us. She is amazing! Since the fabric was torn, Chris reupholstered the chair first. Here, she is just starting to take the staples out. Since she was going to reupholster it, Chris offered to do a workshop on furniture re-upholstery for the library. She used this chair as an example in the workshop. The chair before. Can you see the torn fabric? She covered the chair in white Cotton Duck Canvas. Cotton Duck is a heavyweight, utility fabric that is great for upholstery. 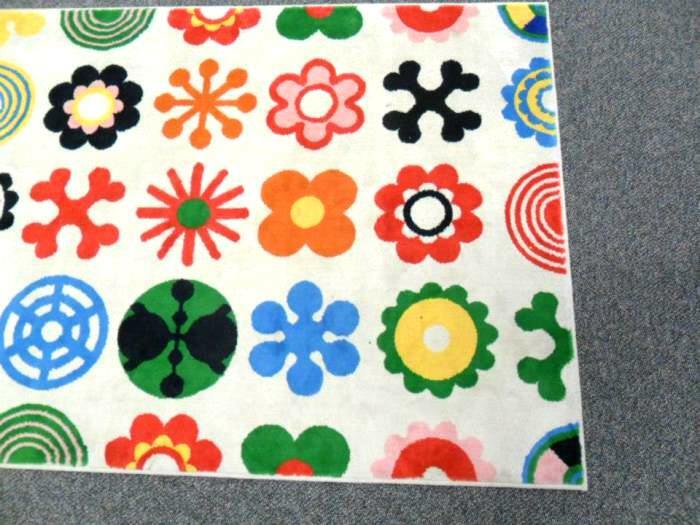 It is also cheap my friends ($5-$10 per yard)! Reupholstered in white cotton duck. Chris took the chair home to paint. It was a complete surprise as to what it would look like completed, but we really couldn’t be happier! The chair is a work of art! I wanted to see how the chair would hold up before posting it for you all. We’ve had it for a year and a half now, and it’s still in excellent shape. And, no, the paint has never rubbed off on our bums. 🙂 I was definitely concerned about this, but the chair gets consistent use and we have never had one problem. 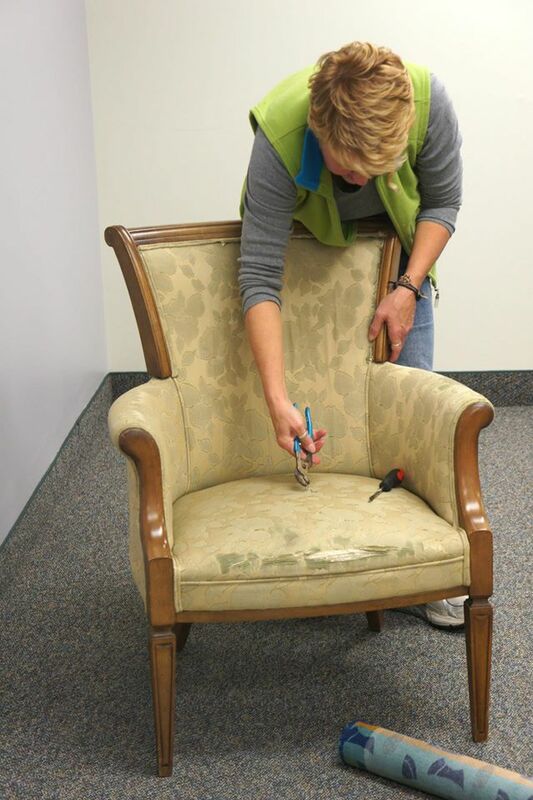 So, if you have an older, tired-looking chair that you’d like to spruce-up – get out the paint! Wouldn’t this be a fun project for your teen group? Give them an old chair, and let them get creative! July 1, 2014 in Library Design & Displays. It was just regular acrylic paint! Did you have to use a fabric medium or a clear coat? That’s gorgeous!!! What great community networking! These are the only pictures that we took from the program https://www.facebook.com/media/set/?set=a.10151231520863536.479006.102527563535&type=3 We were too engaged to remember to take pics….sorry!